Another summer delight is the cucumber. I know–they’re available year-round in the supermarket, but my favorites seldom show up in good condition in the market except at the farmers’ market during the summer, because I can get something besides the “slicing” cucumber (though that will do in a pinch). I like my cukes to be drier and without pronounced seeds, so I use pickling cucumbers to eat instead of the “slicing” or “field” cucumber. During the winter, I’ll use the English (the big long ones in the plastic wrap) or the “baby” cucumbers since they have less developed seeds–and I can’t see having to scrape out that much of my cucumber. A less watery cucumber (than the slicer) is desirable since I like to put them into cucumber and tomato salads, white bean salads, macaroni salads and all sorts of things like that–they are so cool and crunchy. I really don’t want to scrape out the seeds and salt to remove water! Until recently, I’d been using pickling cucumbers, but a friend has introduced me to the Amira cucumber which she has grown in her garden regularly for some years; it’s now become my new favorite cucumber! Long, slender, with a deep green, thin skin, and seeds that are not very pronounced at all, and it is without the one downside of the pickling cucumber–a tendency to bitterness, especially in hot, dry weather. I’ll be planting some of these next summer, to take the place of the Diva (a slicer that does not need more than one plant to set fruit) cucumbers that I have been planting for the last few years. Cucumbers are a member of the gourd family (Cucurbitaceae), which also includes squash, gourds, and melons. 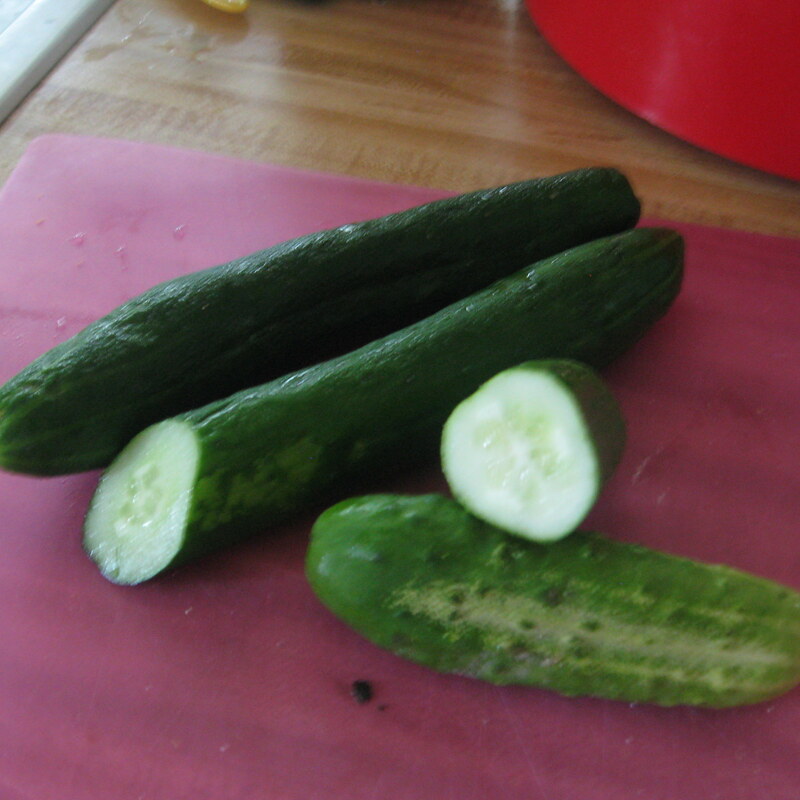 Cucumbers come in three main types: commonly called field or “slicers”, pickling, and “hothouse” or English cucumbers. 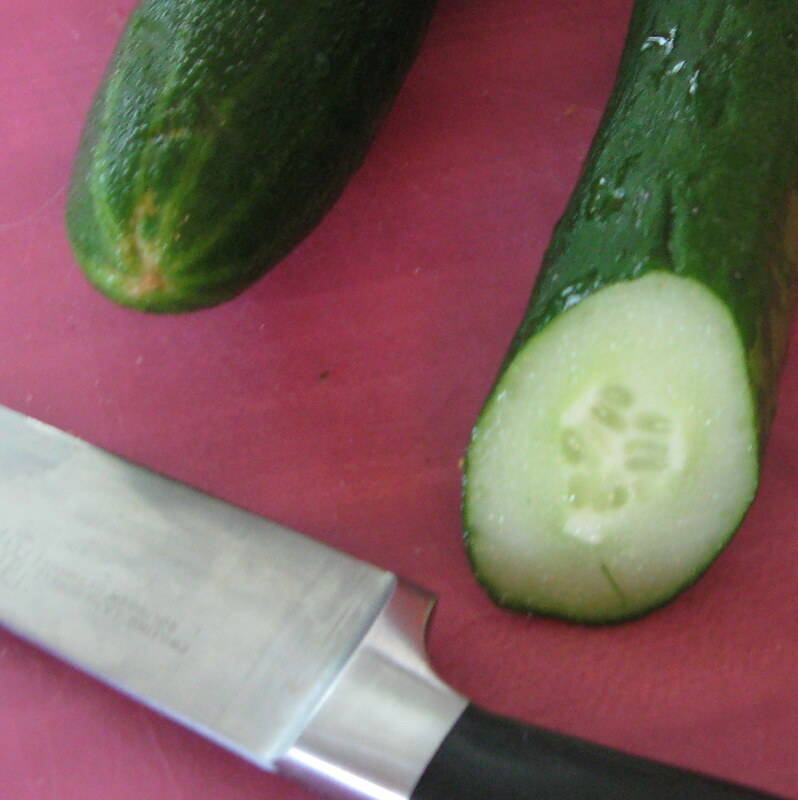 The American slicing (also garden, salad, or field cucumbers) have a thicker skin and are usually waxed (for the supermarket) to prevent dehydration. Since the skin is thicker, I prefer these peeled and because of the larger seeds which may be bitter and tough, and likely will need to be scraped out. These are a “wetter” cucumber and need to be salted to draw out excess moisture before use in salads. (Sorry, no pictures since I don’t have any of those around the house!) In the supermarket, these are the loose ones, with the waxed skin. The pickling cucumber is noticeably different from the slicing or salad cucumber–there are gradations of color, and the skin is bumpy. These are usually shorter and chunkier than slicing or salad cucumbers, but they are perfectly good to use in place of slicing cucumbers. 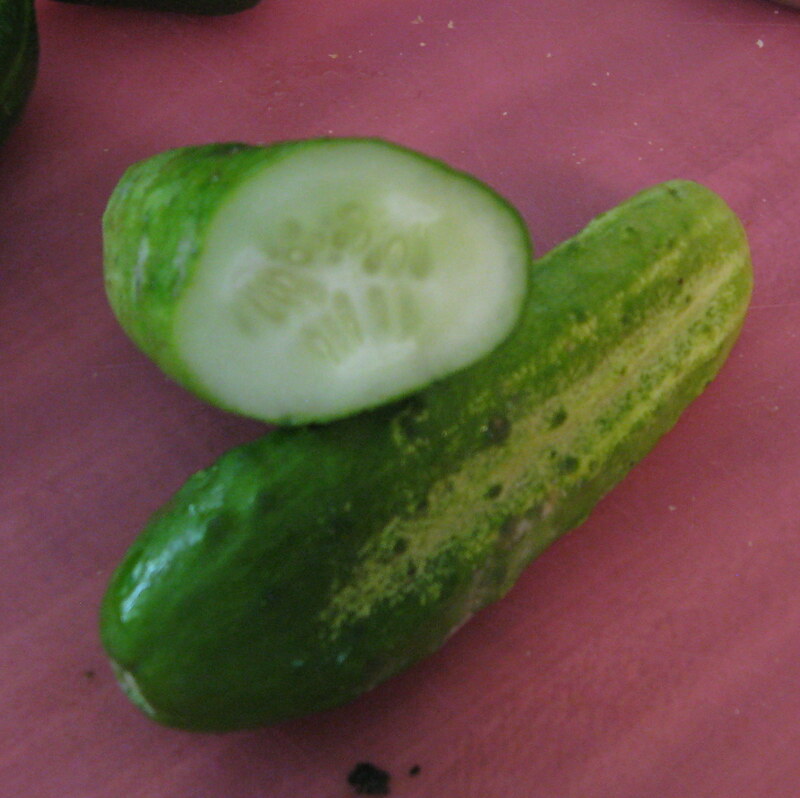 (These will include gherkin and cornichon types which are smaller than other varieties of pickling cucumbers.) When these are found in the supermarket, they usually seem to be dehydrated, since they are not waxed. The English, Japanese, or “hothouse” cucumbers, which are longer and skinnier, and have small seed cavity and small seeds that don’t need to be scraped out. These are sometimes called “burpless” since they do not contain some of the compounds in the skin which can cause digestive distress to some people. These are found wrapped in plastic instead of waxed; the skin is thin so they don’t need to be peeled. Favorite things to do with summer cucumbers include cucumber sandwiches, tomato and cucumber salad (with onion and herbs) as a side dish, or add cheese (maybe feta or ricotta salata) for a light meal (especially with fresh bread to soak up the juice), and I like to add them to other summer salads like white bean salad or pasta salad. Slices are great as a crudity with hummus or other dip (baba ganoush). Then there’s that dish of cucumbers and onions, thinly sliced with a bit of sugar and vinegar and marinated. Or combine them with yoghurt or sour cream, or even make a cold cucumber soup that’s easy and refreshing. Recipes for cucumber salads or soups can be found on the web or in most cookbooks, but I’d especially recommend one of the vegetable cookbooks listed in the bibliography–Marian Morash’s The Victory Garden Cookbook, pages 92-101 for cucumber basics and some more novel uses such as sautéed cucumber, and even baked stuffed cucumbers. Liked reading your posts, keep on cookin’!